Santa Clarita Valley golfers, get ready for the fourth annual Summer Showdown. The SCV Senior Center Foundation is inviting golfers of all ages and ability levels to bring their “A” game to the Tournament Players Club, Valencia, on Monday, June 18, (shotgun start, 9 a.m.). The Showdown, presented by Lockheed Federal Credit Union, has earned a reputation among golfers as a fun event with exciting prizes, great food and cocktails. This year’s Showdown once again offers golfers an unparalleled value, with a green fee package that includes carts, practice balls, breakfast courtesy of the Egg Plantation, a delicious buffet lunch, awards, prizes and trophies. 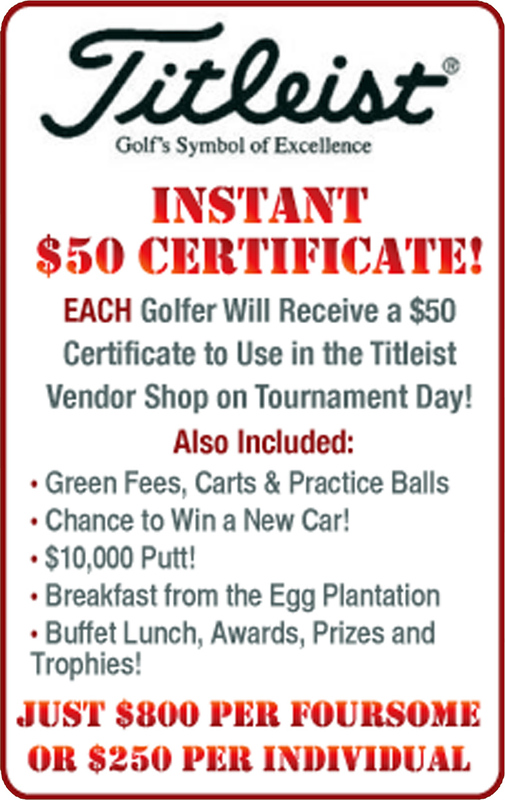 PLUS, each golfer will receive a $50 certificate to use in the Titleist vendor shop on tournament day. One lucky golfer will have a chance to sink a $10,000 putt, and you could win the car of your dreams with a hole in one. The post-tournament banquet will include unique auction and raffle prizes. Watch for our future emails with details on amazing, one-of-a-kind auction items. A variety of sponsorship packages offer businesses great opportunities to support the Senior Center Foundation (see details below). Foursomes cost just $800 and individual players can sign up for $250. You can book your sponsorships and foursomes online, either by clicking below or visiting our website at www.scvseniorfoundation.org. You can also contact Kathy Crone at 661-259-9444 ext. 151, for more information. All funds raised by the Senior Center Foundation benefit the SCV Senior Center’s programs and services for local seniors in need. Please show your support and join the other golfers who know what a great time they’ll have on the course June 18.